If you are looking for information on the Best Ice Melt, you have come to the right place since ice melt is what we know! We not only sell it by the ton, we use it in our own snow and ice removal business! Unfortunately, the telling you “best ice melt” is not an easy straightforward answer. The variety of ice melts are more like the variety of tools in your toolbox. You don’t use a hammer to take out a screw and you don’t use rock salt on glare ice at night when the temp has fallen to -10°. So rather than telling you “the best ice melt,” we will tell you which one is best for which situations. If you are looking for a jack-of-all trades ice melt that will work in most situations without breaking the bank, we recommend Safe N’ Sure Ice Melt. 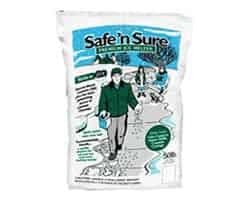 Safe N’ Sure is primarily rock-salt which keeps the price down, yet it mixes in some of the other ice melt chemicals to allow ice melting down to -25°. If you only wanted to buy one ice melt, this is the one to choose. Calcium Chloride like in Peladow Calcium Chloride Pelletspenetrates ice 3 times faster than other ice melts because of its exothermic action (it creates heat when interacting with the ice). 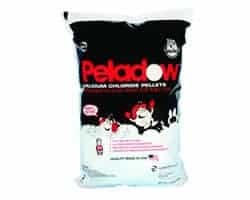 While Safe N’ Sure has a little calcium chloride in it, Peladow is 90% calcium chloride. One of the least corrosive ice melts would be Calcium Magnesium Acetate (CMA). If you have concrete or iron surfaces you would like to preserve from the harsh effects of chloride-based ice melts, this is a great option. It works down to -15°and cuts through ice really well. 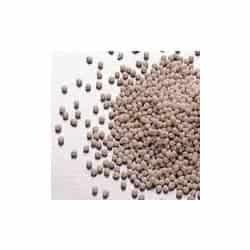 CMA is generally considered safe for plants and petsunless it is overused. Like calcium chloride, it also likes to stay in place and acts like a pre-treatment for your next storm. Many pet owners love PESTELL Paw Thaw Ice Melt, which is made of a sugar based, non-toxic anti-freeze called propylene glycol. It cuts through the ice yet is no more harmful than if your pet stepped in glycerin. You can’t beat rock salt for being cheap! You can normally buy rock salt for a small fraction of the cost of the other deicers. Yet, you get what you pay for. Rock salt is corrosive to your concrete and asphalt, harmful in larger quantities to your plants and animals, and only works to about +15°. 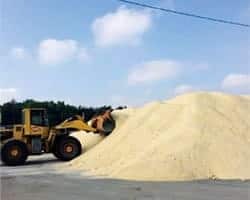 You often have to use more rock salt than the other ice melt products, so in the end, you are saving less money than you may hope, but it is still extremely inexpensive.